Once upon a time, in the grand realm known as Disney’s Animal Kingdom, there was to be a land, a land known as Beastly Kingdom. Beastly Kingdom would welcome myths and legends and creatures beyond your wildest imaginations! But alas, Beastly Kingdom would only ever be as mythical as those creatures that were to inhabit it. Of course, that doesn’t mean that there aren’t glimmers still cast about that show us what might have been. 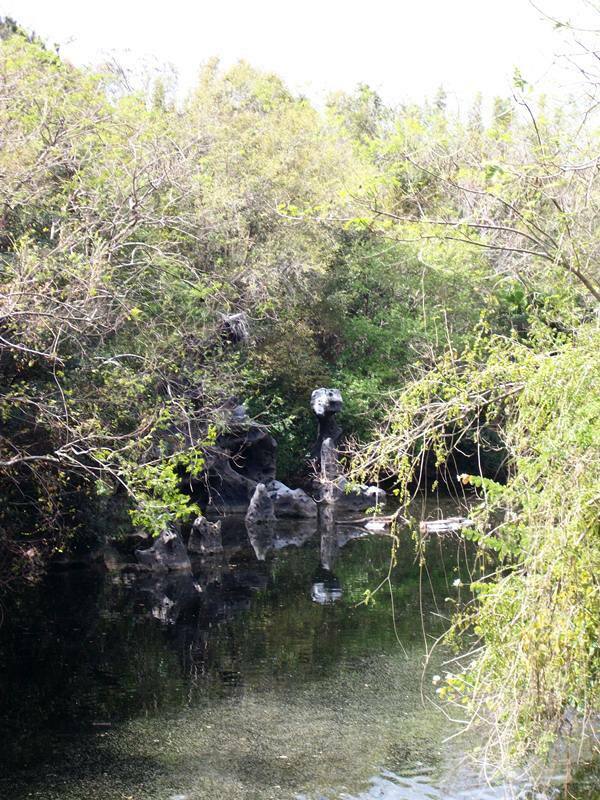 This is the lair of a dragon if I’ve ever seen one! This was one of those tantalizing details that made guests start to wonder what could be awaiting them when the major additions finally arrived at Disney’s Animal Kingdom. 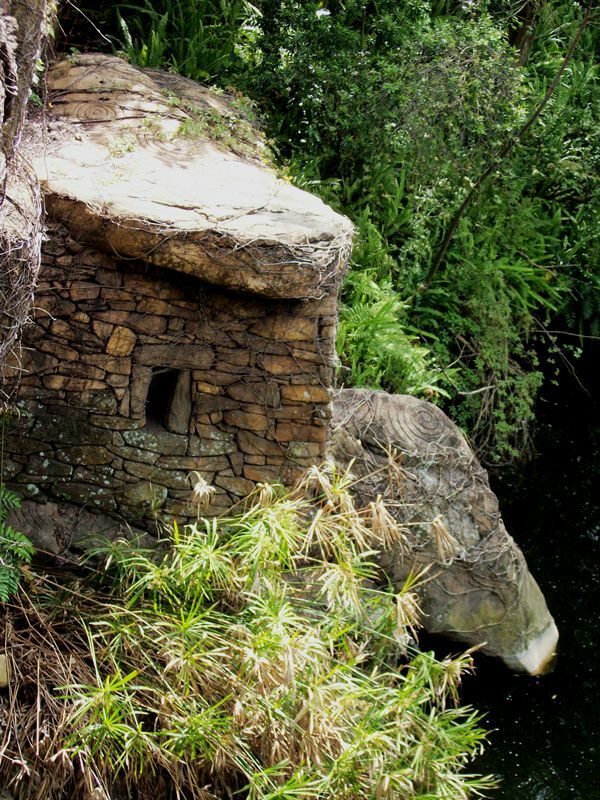 The dragon’s lair had life to it at one point in time, as fierce inhabitant would roar at guests as they passed by aboard one of the now defunct Discovery River Boats. A little bit closer to the bridge for Camp Minnie-Mickey sits this fellow. 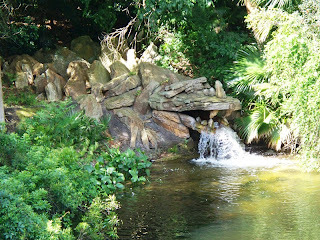 The outlet for the stream that runs through Camp Minnie-Mickey is formed by a tumbling of rocks that have the odd appearance of a dragon/giant lizard. Is it just your eyes playing tricks on you, or is this rockwork the perfect guardian and greeter for what was once slated to become Beastly Kingdom? Many guests, whether they are aware of the history of Disney’s Animal Kingdom and Beastly Kingdom, stumble upon one or both of the previous entries in this article as they make their way to Camp Minnie-Mickey. However, you really have to crane yourself over the side of the bridge to catch a glimpse of the ruins that were once to be the boundary of Beastly Kingdom. These ruins of stacked blocks and intricately carved shape patterns are a bit out of place for a summer camp inspired by the Adirondacks, but they would have fit in perfectly for an area that took guests to far-off lands populated by ancient and legendary creatures. Beastly Kingdom may have been born out of the ideas found in storybooks of long ago, but not all of its notions stayed on those pages. Some of the craftier elements found a way to escape into our world of Disney’s Animal Kingdom, and I’m certainly glad they did and that these small nods to the concept still remain! Sigh. I understand why Beastly Kingdom never happened, but it's still such a shame. Here's hoping the coming additions are really spectacular. Beastly Kingdom fascinates me, I love all the little footprints of it left behind in AK. It's such a shame it never came to fruition at the time. Avatar Land is going to be close as we can get to having a Beastly Kingdom but I still think they need dragons and unicorns lol! Like to extend your vacation?